Itappears that for about half the country, the local weather willunfortunatelynot cooperate for a view of tonight's big moon show. For cities suchLosAngeles, Chicago, Denver and Boston, the total lunar eclipse willlikely betotally eclipsed by clouds. On the other hand, New York, Philadelphia,Miami andDallas should enjoy mainly cloud-free conditions. Stubbornlow clouds are expected to disappoint prospective eclipse watchersacross muchof the upper Midwest, lower Great Lakes, and parts of the South andnation's heartland. Light snows will fall from northern Indiana through theChicago area, thennorthwestward into much of Wisconsin, northern Minnesota and northeastNorthDakota. Meanwhile,an active storm track from the Pacific Ocean is expected to bring awidespreadswath of clouds and precipitation across much of California, and partsof the intermountainregion and desert Southwest. Heavy rains will soak the Los Angelesarea, whileheavy snows are forecast for parts of southern and western Utah andover thePark and Sawatch Ranges of Colorado. MuchofWashington State, western Oregon and northern Idaho will also likely berobbedof a view of the totally eclipsed moon, thanks to an offshore Pacificstormsystem. Finally,central and northern New England will likely be plagued by cloud cover,theresult of an intensifying storm southeast of Nova Scotia. The stormwillbacklash this region with strong, gusty winds, considerable cloud coverandlight snows for northern Vermont, northern New Hampshire and much ofMaine. 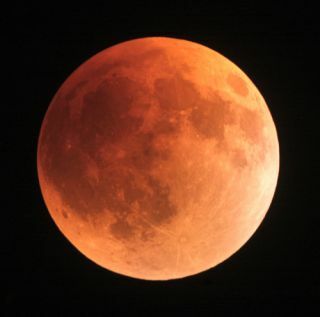 Therestof the United States should be able to partake in at least some viewsoftonight's lunar eclipse. Regionsthat are highly favored to have clear skies include the greater NewYork areaand points south down into the middle Atlantic Coast, as well as muchof Texasand southern and central Florida. Therearetwo ways that you can deduce your chances of getting a view oftonight'seclipse. You can visit thisNational Weather Service site, which will provide you withlinks to morethan 100 local Service Forecast Offices for the very latest forecasts,as wellas satellite images and radar scans. Youshould also check out Canada'sWeatherOffice, which was developed by Environment Canada. This site providescloud forecasts for the United States and much of southern and centralCanada,at hourly intervals up to 48 hours, which can be interpreted in thesame way assatellite pictures in the visible spectrum. This site is particularlyuseful ifyou're in a zone where the weather is expected to be unfavorable; ifyou'remobile, you can determine where the nearest area of clear skies mightbe.